If you’ve ever visited a warehouse making use of floor tape, you may have noticed their clean, easily defined walkways and organization. You might also have noticed that, even as a new visitor to the premises, you could quickly find your way around and identify the areas you should and shouldn’t be standing in. It may have even struck you as a neat idea to start using the stuff in your own factories and warehouses… but where to start? Right here, of course! In this blog post, we’re going to go over several places where you can start using floor tape to keep your operation running safely and efficiently. In a busy workplace, especially one in which heavy or moving machinery is in use, maintaining safe walking aisles should be a top priority. In such production facilities, the largest risks to worker health are slips and falls and they should be avoided in any way possible. Using floor tape to designate and maintain walking lanes is a great way to accomplish this. Consider using yellow tape to mark off all of the places in which employees can safely move without risk of interference from material bins, machines, or vehicles. These aisles should be kept clear at all times and tape should be maintained if it becomes overly dirty, scuffed, or torn up. Using tape to mark off dangerous elements of your workplace is also a great approach. Take electrical or control panels, for example. These items shouldn’t be interacted with except by trained professionals, and you don’t want employees trying to fix or tamper with objects they aren’t trained to deal with. For this reason, marking off these areas with red floor tape can help alert workers to areas they should steer clear of. Dangerous machinery can also be indicated with floor tape; consider a machine that has a swinging arm, for example. You can use floor tape to mark off the radius of the moving part, so that its full range is indicated visually, this way potentially dangerous machine components are in employees’ awareness no matter what specific location they’re actually at. 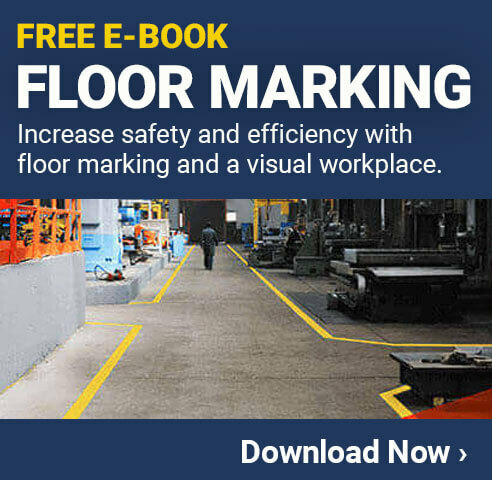 You can use the same principle to mark off the swing radius of frequently opened and closed doors in and around the work floor. Red floor tape often makes another appearance in the case of hazardous materials and production components. Sometimes material containers are inadequately marked or may look safe to move or handle at a glance when they in fact require certain safety equipment or procedures. These items can be marked off or placed in an area designated by your floor tape. This way, employees will know where to place hazardous materials, and future workers will know that materials in the area are potentially dangerous. Just as red means stop, green means go, and you can apply this principle to your taping in the workplace. Green floor tape is often used to indicate safety equipment or emergency stations and make them stand out to workers. If you are working in a plant that deals with chemicals or hazardous materials, for example, one might indicate emergency eye and skin wash stations with floor tape. The same goes for things like spillage showers, fire extinguishers, fire blankets, emergency shutoffs (for things like water, electricity, or a specific machine) and more. In all cases, it can be beneficial to workers that you tape off the path to each piece of safety equipment with the same color of floor tape to assist workers in getting to them in hectic situations, which can be disorienting. One of the most common uses of floor tape, especially in organizational projects such as 5s, is to designate where moving objects should be returned to when a worker is finished with them. Pallets, for example, are used in countless warehouse industries and can easily pile up in random places after they are emptied. In one of the better places I’ve worked, stacking areas for empty pallets where indicated with white floor tape; one box for pallets that previously contained paint and one for empty pallets that had contained concrete, as these were two of our top selling products that came shipped on pallets. Having two stacks not only kept them out of our way in the main work area, but allowed us to keep an eye on how much inventory we’d had come in and go out recently. This can also be used on a smaller scale, for example, for a workers tool kits, or for pallet jacks. These items are easily left lying around near the most recent jobs sites. While it may not seem efficient to walk them back to a floor-taped box every time, it saves other employees more time that they would have to spent looking for said equipment if you had just left it in a random location. Many companies use floor tape to indicate machinery or equipment that needs inspection, in order to signal other workers that something is wrong with a machine and to alert maintenance workers to take a look at it. Alternatively, things that are already under repair (but may have to be left unattended for a while) can also be marked off with floor tape so that employees know not to try to operate or turn on a machine. It might be a good idea to provide your workers with this floor tape so that they can quarter off and report machine stoppages to your engineers themselves, bypassing the need for management as a constant middleman. In most cases, blue floor tape is used for this purpose. Floor tape is a highly versatile tool that can be used to make all manner of improvements within the busiest places of your business. While these are good starting points, you can always get creative and think of your own, especially if there are more relevant applications to your own business. For example, floor tape may be used in loading bays in businesses which utilize delivery trucks to indicate where loading materials should be placed, or even where the truck itself should park for easy loading. General organization is also a great use for floor tape; you can simply organize all of your materials and their placements using tape boxes or lanes. Also, don’t get bogged down when it comes to which colors represent what, we’ve only assigned colors to each of these uses a suggestion, and as an indication of what others in the industry are using. The most important thing is that you’re consistent so that your system is easy to identify for your workers. It is also worth noting that floor tape, like any safety device, requires discipline to integrate into your workers’ daily habits. If the boundaries the tape represents aren’t honored (for example, if items that don’t belong are consistently placed within a pallet stacking area, or normal materials are placed/mixed in areas designated for hazardous ones), then the system breaks down quickly. Be sure to keep focused and task managers with watching for compliance during their shifts, at least for the first few weeks while the new system becomes a habit for everyone.